Just before last Christmas we did something we almost never do … we went on a beach vacation. Now, ordinarily, lying on a beach all day, sun-tanning and ordering drinks from the pool bar, is not our kind of thing, but after a very busy autumn of work and school for Kathryn and Emma (respectively), they were ready to relax and decompress for a few days before the Christmas festivities began. While I was by no means deserving of such a break, someone had to go along to fluff their cushions, freshen their towels, and refill their drinks, right? Not a bad view from our resort on the stunning coast of the Gulf of Oman. Some of the preferred destinations for sun-seeking Europeans at this time of year include Dubai, the Canary Islands (Spain), Sharm el-Sheikh (Egypt), and, further afield, Mauritius and Thailand. 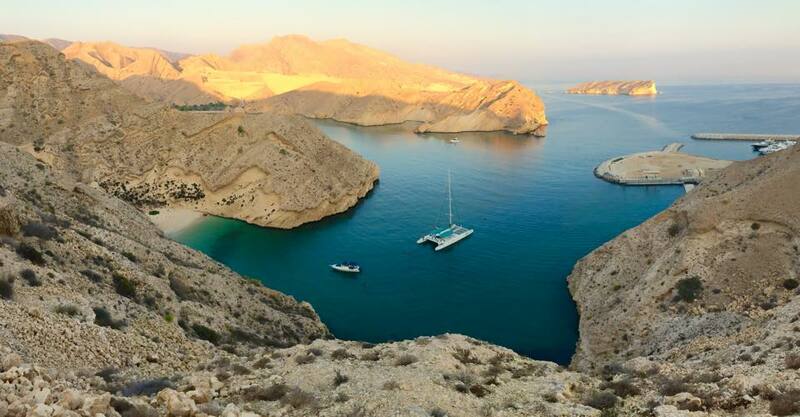 Through word of mouth among other expats, however, we had heard that the small country of Oman (on the tip of the Arabian peninsula) was a quiet, beautiful, and low-key alternative to the former hot-spots. The fact that it was Arabic and Muslim added further appeal, as this was not a part of the world we had ever spent any time. And so a week before Christmas we found ourselves making the seven hour flight to Muscat (the capital of Oman) via Abu-Dhabi (UAE). Oman is a pretty obscure country to most Westerners. While you may have heard of it, you’d be hard-pressed to locate it on a map. So bear with me while I provide a little background. The Sultanate of Oman (its official name) is a small Arabic country located on the far southeastern tip of the Arabian Peninsula, bordering the United Arab Emirates and Saudi Arabia to the west and Yemen to the south. To the north of the country lies the Gulf of Oman and the Straight of Hormuz (which gives passage to the Persian Gulf), on the other side of which lie the countries of Iran and Pakistan (see map). Oman has a population of roughly 4 million, although somewhere between 30-40% of the population is made up of foreign workers (predominately from India) who work in the oil and gas, construction, shipping and tourism industries. The native Omani population is comprised of assorted Arab tribes, as well as a mix of non-Arabic ethnic groups (Persian, Baloch, Zanzibarian) whose presence reflects Oman’s history as a hub for trade and commerce in the Persian Gulf and the Indian Ocean. The vast majority of indigenous Omanis are Muslim, most of whom subscribe to the ancient Ibadi sect, which predates the much larger Sunni and Shiite sects. Ibadi Islam is deeply conservative, yet historically moderate and tolerant towards other faiths. Due to its large expat population, Oman also has large Hindu, Christian and Buddhist communities, particularly in Muscat. Sultan Qaboos Grand Mosque, in Muscat. Not surprisingly, the country is both politically and socially conservative, although somewhat less so than its other Arab neighbours. The country is ruled by Sultan Qaboos bin Said al Said, who rules with the powers of an absolute monarch. While there is an elected assembly – the Majlis al-Shura – its powers are strictly consultative. Outspoken political dissent is not tolerated and the government has been accused of human rights abuses with respect both to political opponents and disgruntled foreign workers. A curious blend of the modern and the traditional. 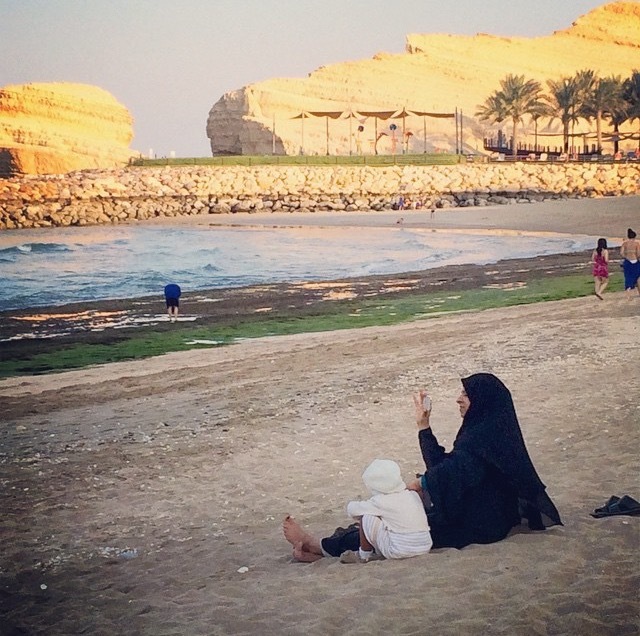 Clad in her a abaya, a resort guest checks messages on her smartphone. On the other hand, Qaboos has slowly relaxed his grip on power and sought to modernize the political system. Women, for example, were granted the right to vote and serve in public office in 1997. Additional political reforms granting more power to the Majlis were introduced in the wake of protests inspired by Arab Spring uprisings in other countries like Egypt. Like most Arab states, Oman possesses large reserves of oil and gas, which form the basis of much of the economy. Over the last couple of decades, however, Oman has attempted to diversify by promoting other sectors, including tourism, small business, and banking, with some success. 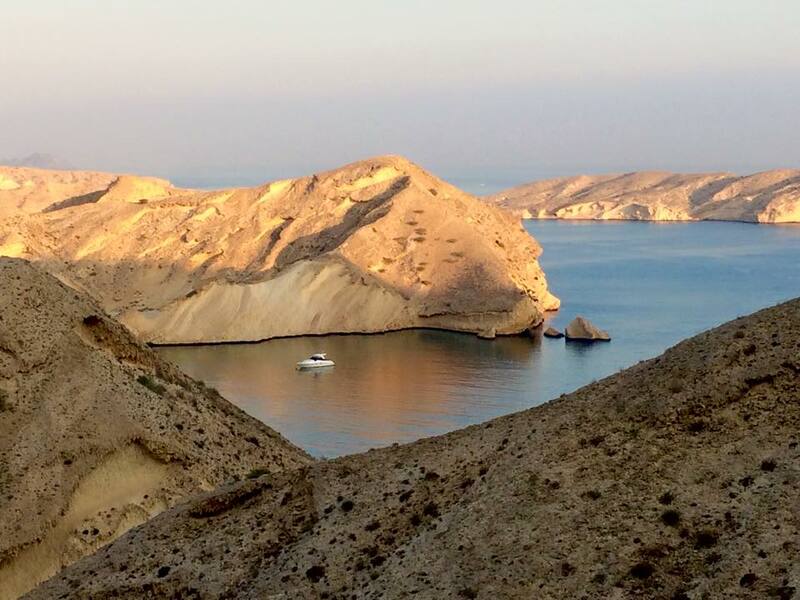 In contrast to the hyper-commercialism of neighbouring Dubai, Oman attracts tourists with stunning scenes like this. Unlike neighbouring Dubai, Oman’s development has been measured and gradual, thus helping it avoid the commercial excess and boom-bust cycle that has plagued its flashy neighbour to the west. Instead of trying to attract tourists with exclusive shopping centres, highrise hotels equipped with heliports, indoor artificial ski hills and other gimmicks, the Omanis are attracting visitors by promoting the natural beauty of the country’s rugged coastline, high mountains, and verdant oases, and the richness of its traditional, diversified culture. It was this that appealed to us the most. 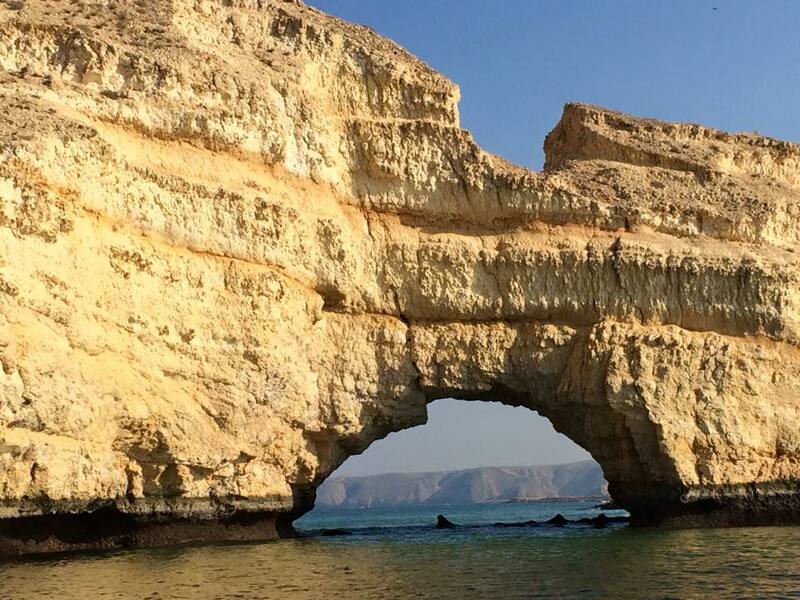 Oman seemed to offer the opportunity to experience an Arabic country without the distorting lenses of ostentatious wealth, hypercommercialism, or violent jihadism through which the Arab world is so often seen today. 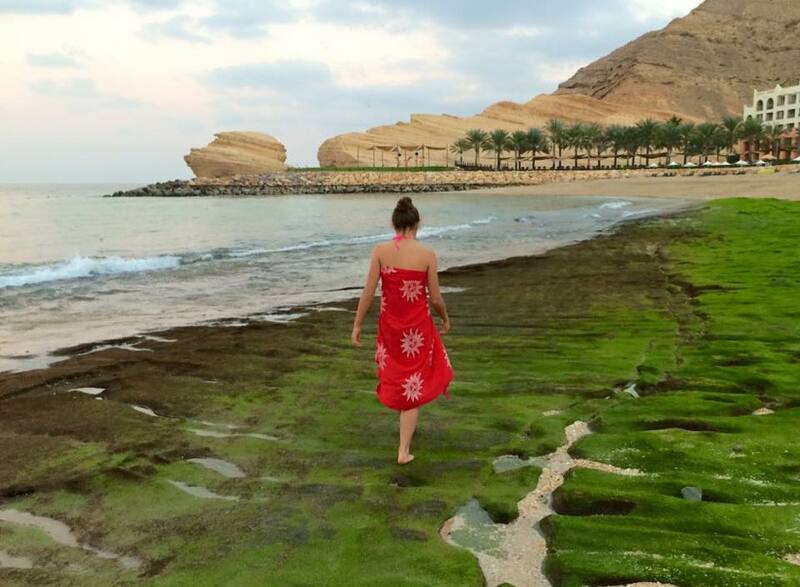 We enjoyed a wonderful four days at a secluded coastal resort about 45 minutes outside of Muscat. To be honest, we didn’t do very much other than read books and lie on the beach, with the occasional dip in the pool or ocean to cool off; barely worth writing about really. However, once or twice a day we snapped ourselves out of our lethargy to do something memorable. What follows are a few snapshots and impressions from those times. Hunting for shells and other treasures at low tide. The coastline along the Gulf of Oman is extremely stark and rugged. The Al Hajar mountains rise straight out of the turquoise coastal waters to form a 100 kilometre wide barrier between the Gulf and the deserts lying inland to the south. The tallest Al Hajar peaks rise up to 10,000ft. The coastline itself, almost devoid of vegetation, is crenellated with deep inlets and coves, many with wild beaches. One of our favourite ways to enjoy the coast was by getting up early and going running along the beaches and coastal roads near the resort, before the heat of the day set in. The contrast between the rugged mountains, bathed in golden early morning sun, and the dark turquoise waters of the Gulf was breathtaking. Beating the daytime heat with an early morning run. 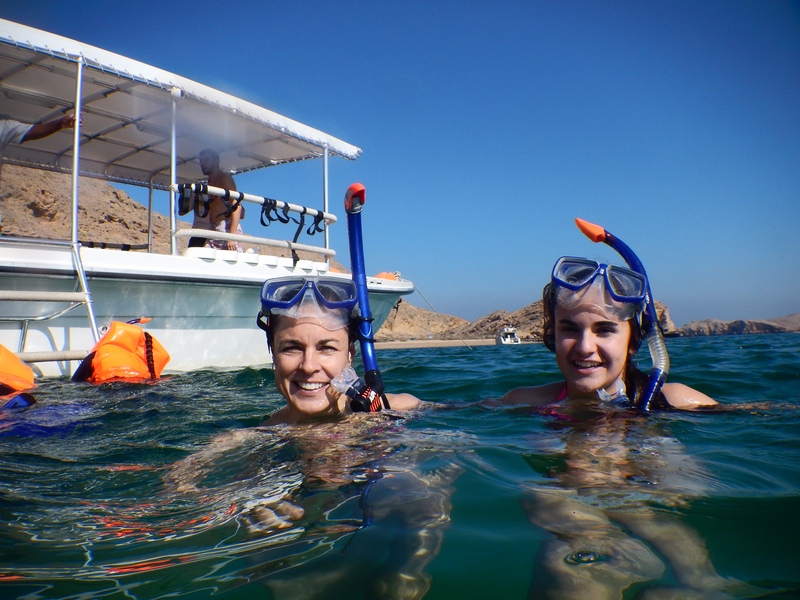 Oman’s rugged coastline makes for good snorkeling and diving, so one afternoon the three of us hopped on a dive boat to do some snorkeling in one of the area’s many protected coves. 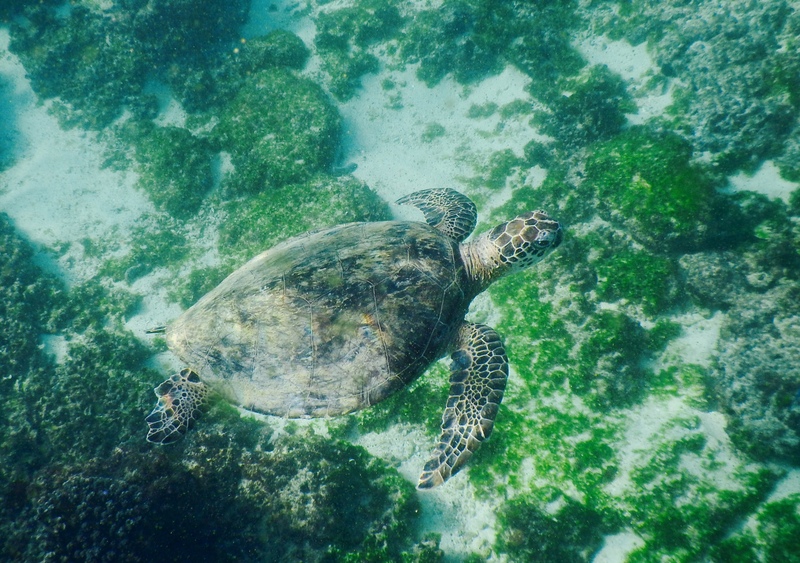 Among the creatures we were most looking forward to seeing were a number of species of sea turtles, including the endangered Hawksbill sea turtle, who are drawn to the area’s secluded beaches for nesting. One of the seas turtles we found in the Gulf of Oman. After an exciting ride on a boat fast enough to outrun a Somali pirate skiff, we jumped into the waters off a small island to see what we could see. Here we found plenty of colourful fish and one small Hawksbill sea turtle. 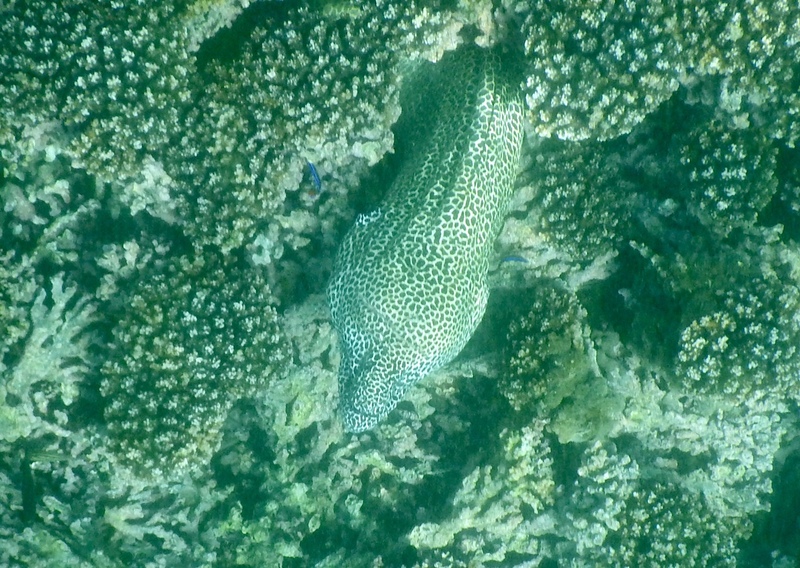 We also got a thrill out of seeing the head of a large Moray eel sticking out of its hole in the coral. I went in a little closer for a photo, but seeing its gaping maw and knowing there were another few feet of eel as thick as my arm hiding down that hole, I kept a safe distance. Apparently the Moray eel’s reputation for aggressive and ill-tempered behaviour is undeserved, but I wasn’t about to test the theory. We kept a safe distance from this Moray eel. 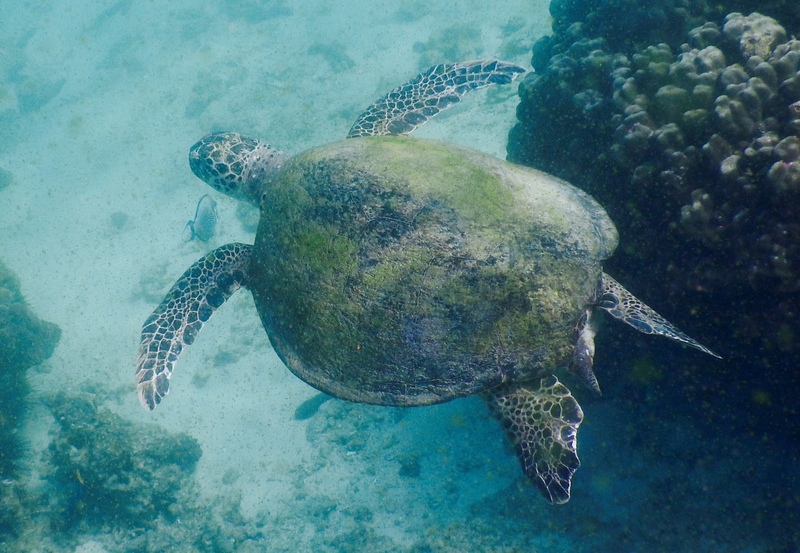 This large Green sea turtle was about a metre long. A little further down the coast we found another site with a half dozen turtles, including Hawksbills and a large Green sea turtle as well. It was fun to follow along for a bit as these gentle creatures would glide through the water. Snorkelling in the Gulf of Oman. 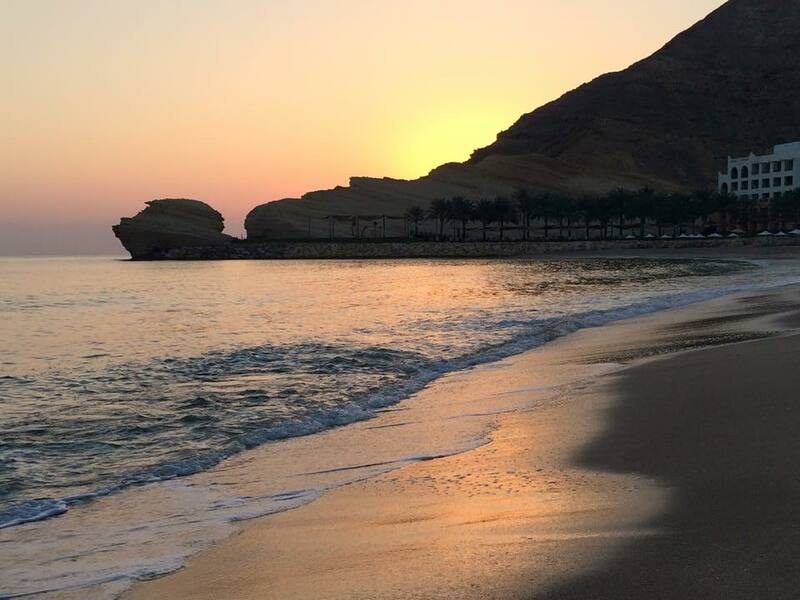 While we enjoyed the natural beauty of the coastline, we didn’t get out of the resort bubble much to explore Muscat and the surrounding communities, or interact with the local population. 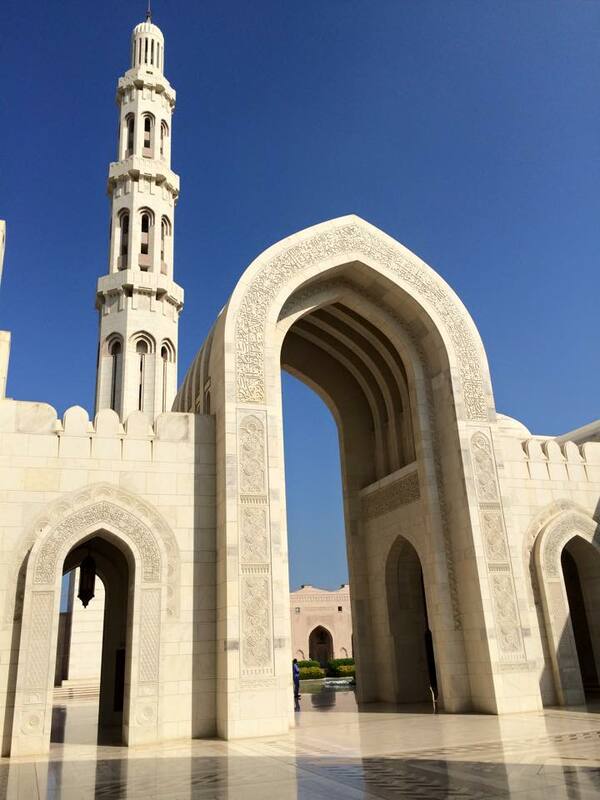 One morning, however, we drove into Muscat to visit the Sultan Qaboos Grand Mosque, which opens its doors to non-Muslims most mornings of the week. Built to commemorate the 30th anniversary of Qaboos’ reign, the Grand Mosque was opened in 2001 and stands as one of the world’s most impressive examples of contemporary Islamic architecture. Arch near the entrance to the main prayer hall, with the mosque’s main minaret behind. The Grand Mosque features a 90m high central minaret and 4 smaller minarets, plus a large complex of buildings and halls, all built out of Indian sandstone. The two main prayer halls or musallas – one for men, one for women – have a combined capacity to hold almost 8,000 worshipers. Hovering above the centre of the men’s musalla is a massive 50m high dome. Another building houses the Islamic Information Centre, which features a library and research centre. Visitors, both Muslim and non-Muslim, are welcome to meet in-house theologians to discuss aspects of the Islamic faith. Main prayer hall and carpet. 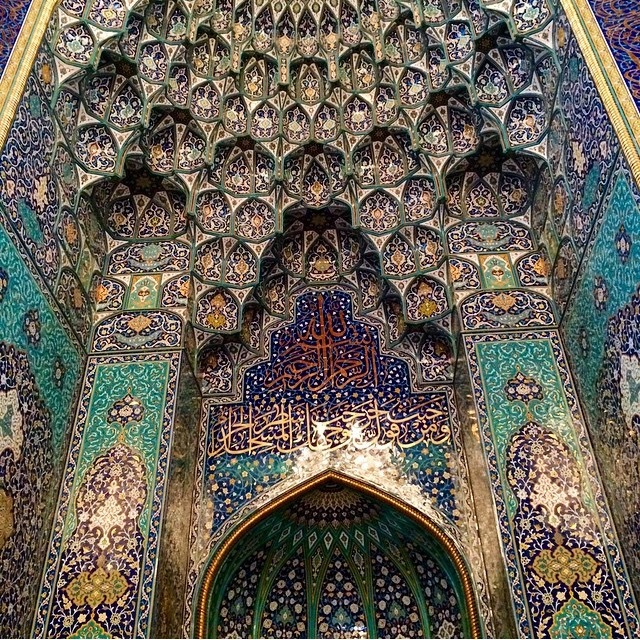 The mosque’s interior is equally impressive, with three major features: the prayer carpet; central chandelier; and the mihrab (an ornate niche in one wall indicating the direction of Mecca). The main prayer rug is a single woven piece measuring 70m x 60m and took 600 Iranian weavers four years to produce. Containing nearly 2 billion knots and weighing 21 tons, it was the largest single woven carpet in the world, until that title was recently scooped by the United Arab Emirates, which had an even larger one made for an even newer mosque. A 50ft high chandelier hangs from the ceiling of the great dome. Hanging from the inside of the top of the dome is a massive 50ft high chandelier festooned with thousands of dazzling Swarovski crystals. 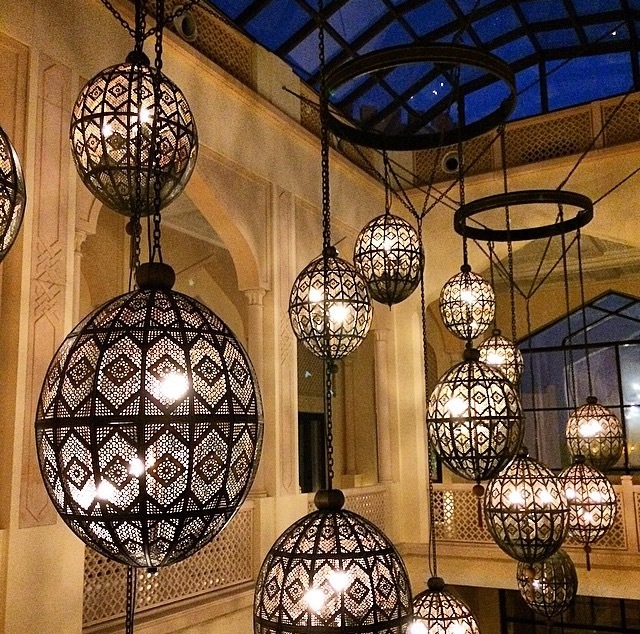 Weighing over 8 tons, the chandelier was the largest in the world until it, too, was eclipsed by a bigger one commissioned by the Emirate of Qatar. The third and final important interior element is the mihrab, the prominent niche in one wall that indicates the direction of Mecca and provides a focal point for prayer. Here the mihrab is 10m tall and lavishly decorated with mosaics and tiles in cool hues of blue, purple and green, accented with luminescent gold. 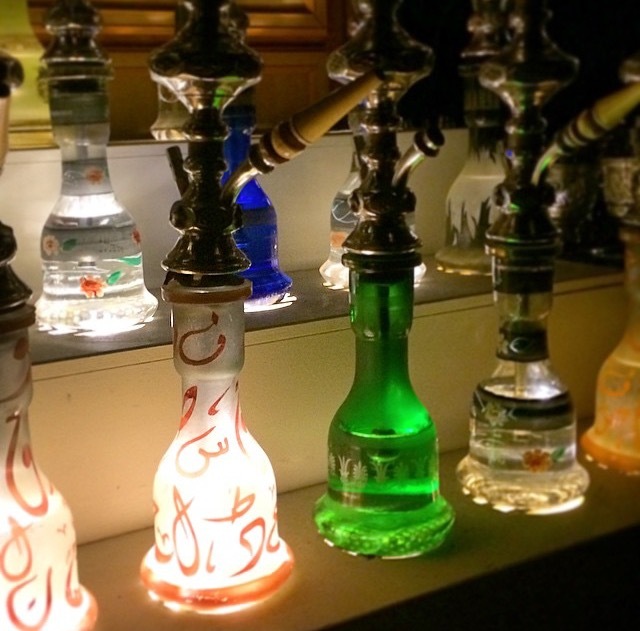 The ornately beautiful mirhab indicates the direction of Mecca. In order to gain access to the mosque grounds and interiors, all visitors are required to observe a strict dress code, with legs, torsos, arms and feet completely covered. Women are also required to cover their heads and necks with a hijab, but a shawl will also do. Footwear must also be removed before entering the prayer hall. Kathryn and Emma in front of the mirhab. 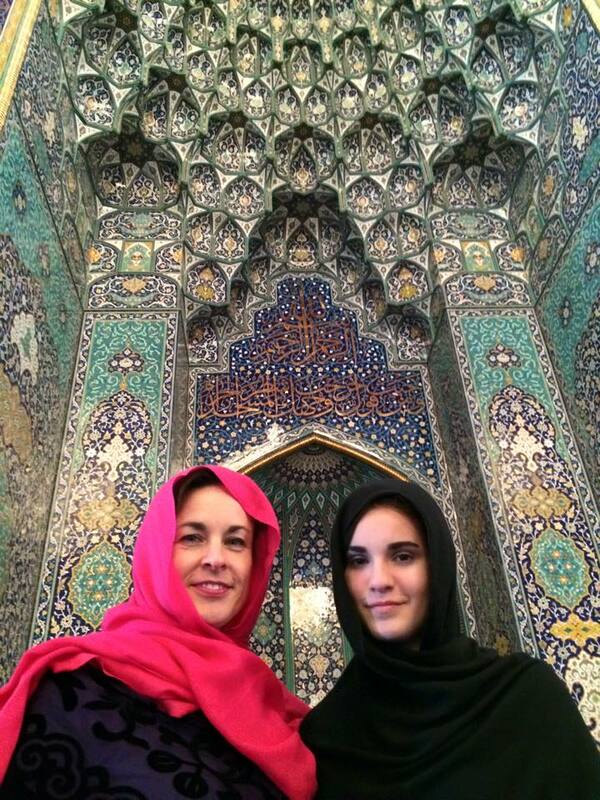 We wandered the interior and grounds of the mosque for an hour or so, admiring the architecture and craftsmanship. Witnessing the mosque filled to capacity with worshipers, taking in the sights and sounds of collective prayer, would be something to experience. 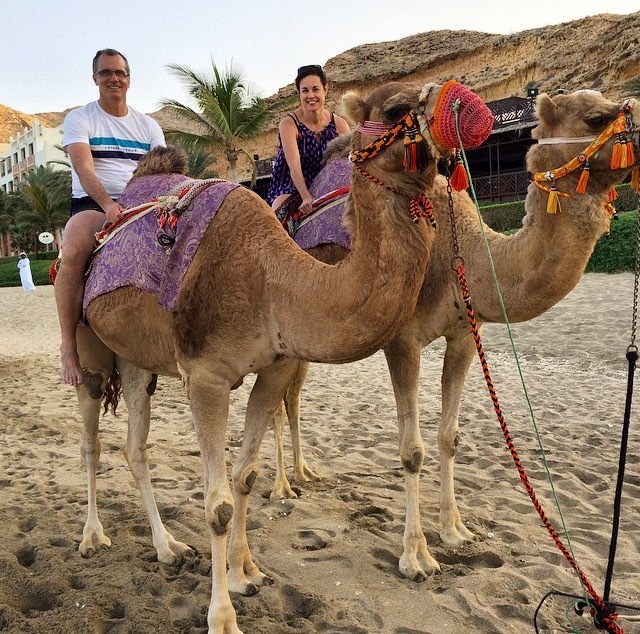 A final memory of our stay in Oman was a short camel ride that we took on the beach the evening before we left. 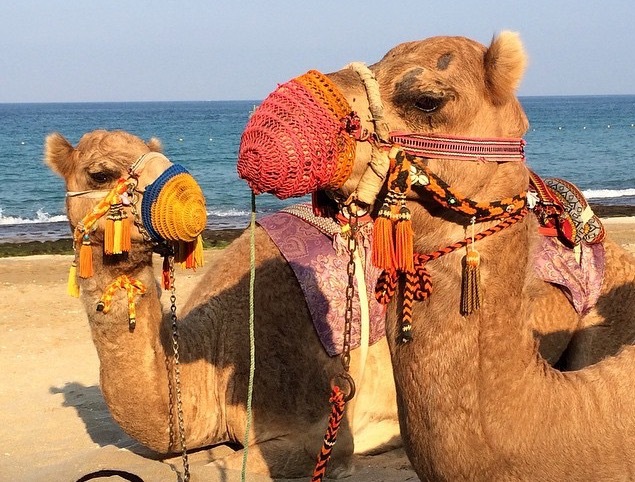 A local man kept two camels on the beach offering short rides to the tourists. I couldn’t talk Emma into joining me, but Kathryn was game! Mounting a camel, it turns out, is a bit of a process. First the man had the camels lie on their stomachs. Then, while he held one of the beasts down by the neck, Kathryn climbed onto the small saddle on its back. Extraordinary and rather rude-sounding noises started emanating from the camel! Once Kathryn was securely seated, the man released the camel’s neck and its rear end shot up quickly as it stood up hind legs first. Kathryn pitched forward violently and for a second I thought she would fly off the front of the animal and face-plant in the sand. As its front legs extended, however, she stopped pitching forward and was soon smiling while seated high atop her mount. 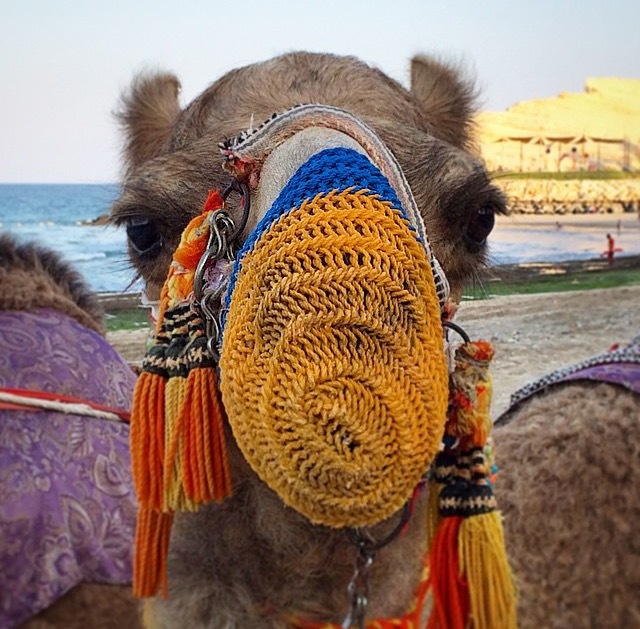 Because honestly, how many opportunities do you get to ride a camel?! My turn next: more rude sounds followed by a jerk forwards and upwards, and there we were aloft together. We promenaded up and down the beach a couple of times, laughing at what goofy tourists we were. Our ride lasted about 10 minutes, and that was enough for both of us. Now I can check camel-riding off my bucket-list. 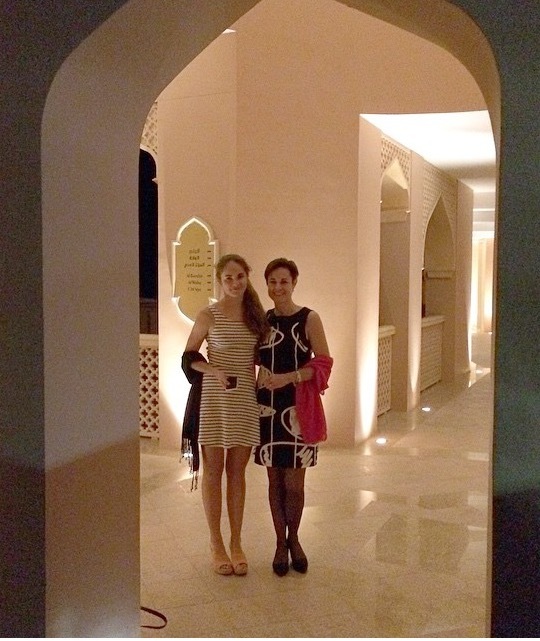 Dressed to kill on our last night in Oman. Our return flight home out of Abu-Dhabi began with a pretty interesting flight path. 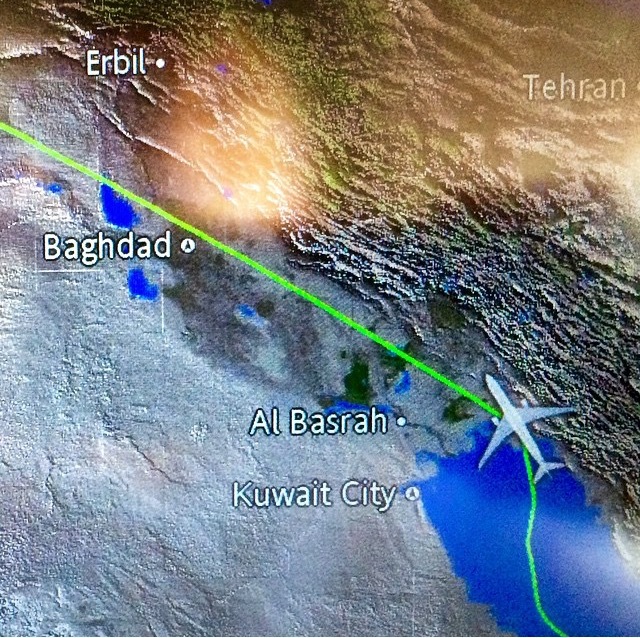 After taking off, our Etihad flight proceeded to head west straight up the middle of the Persian Gulf. After an hour or so we made landfall over the coast of eastern Iraq. The flight plan map on the console screen in front of me showed our projected flight path as taking us right over Bagdhad and beyond! I found myself wondering about the range of Islamic State’s surface-to-air missiles, when our pilot came on the PA system to announce that our flight path had been re-routed north into Iranian airspace. As we passed out of Iraqi airspace I found myself wondering about the fate of those on the ground below, ravaged by senseless conflict for so many years now. Traveling between such a place beauty, calm and privilege, on one hand, and one of such horror and devastation, on the other, within the space of an hour or two, certainly prompted some reflection on how fortunate we are. Let’s hope that the violence that is convulsing so many parts of the Arab world is resolved soon, before more lives are lost and more of its natural heritage and cultural richness is destroyed.